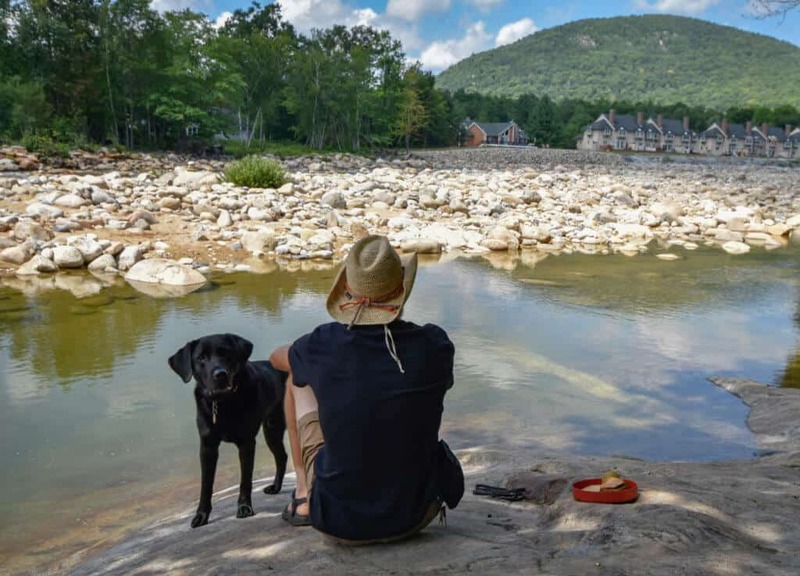 Where can you find hard-core hiking opportunities, spectacular waterfalls and swimming holes, a world-famous scenic byway, and a relaxing resort that will turn your New Hampshire road trip into a true vacation? If you said Lincoln, NH, you’re spot on! 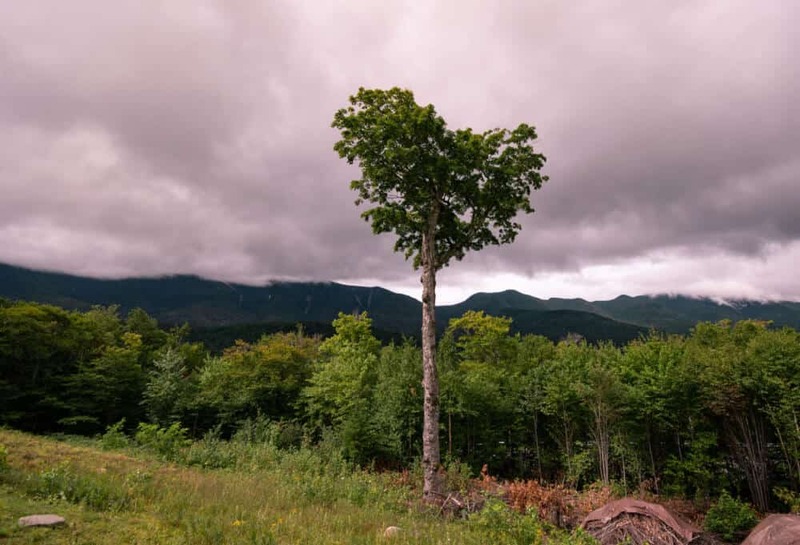 This quaint resort town is nestled in the western White Mountains of New Hampshire, and it’s a mecca for hikers, campers, roadtrippers, and family vacationers. We had the pleasure of visiting Lincoln, NH in August, and were thrilled to find out that the town is extremely dog-friendly as well. 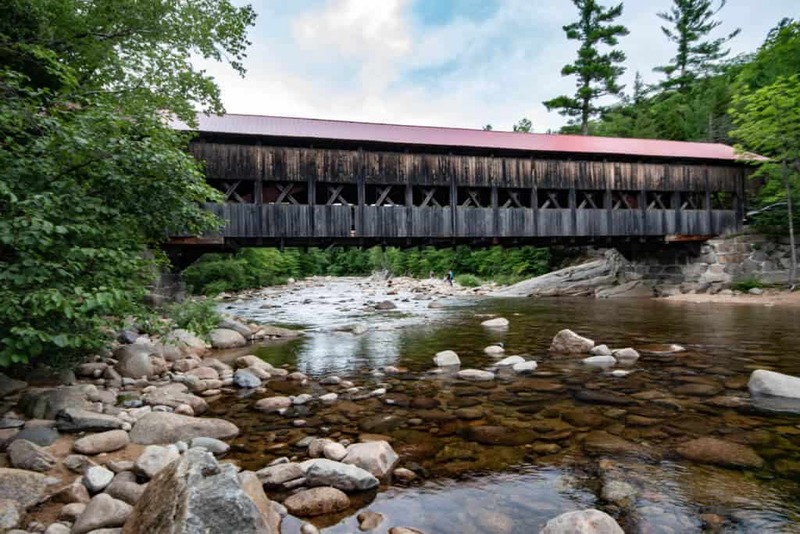 So whether you’re embarking on a family road trip, a weekend getaway, or a serious outdoor adventure in New Hampshire’s White Mountains, here are some Lincoln, NH attractions you won’t want to miss. Locals love it when you can pronounce this famous scenic byway correctly, so the first thing you should know is that it’s “Kank-ah-mah-gus”. The Kancamagus Highway is a 34.5-mile stretch of pavement that winds from Lincoln, NH to Conway, NH. It cuts through the White Mountain National Forest, providing spectacular views of the surrounding mountains. It is particularly lovely in the fall, and has been named one of the most gorgeous fall-foliage drives many times over. 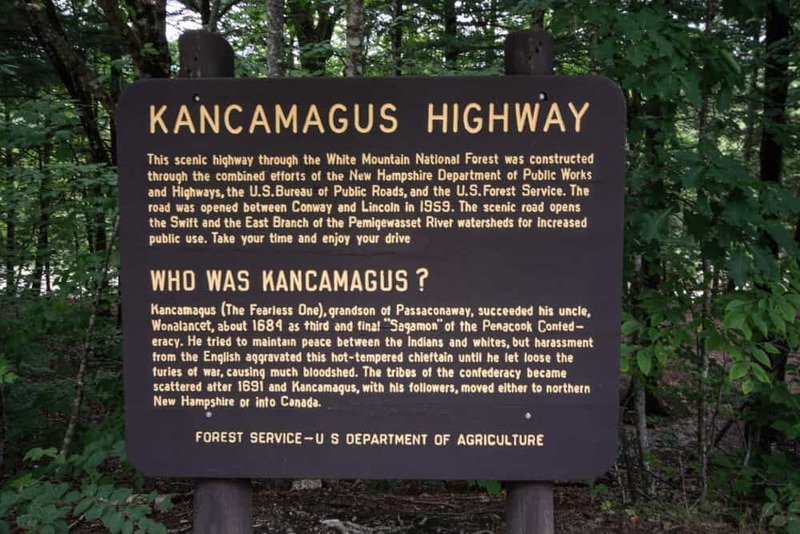 There are no stores, gas stations, or lodging on the Kancamagus Highway. It’s a bit like stepping back in time, just you, your car, and the ancient forest. You will find 6 front-country campgrounds, running between $20 and $25 per night. All are first-come-first-serve, except Covered Bridge Campground, which can be reserved on Reservation.gov. The Kancamagus Highway is affectionately known as the Kanc to those who love it, and exploring this scenic byway was definitely one of the highlights of our New Hampshire getaway. There are plenty of adventures to be had on the Kancamagus Highway, but unless you have days and days to spend hiking and camping, it can be hard to choose what to see and do. 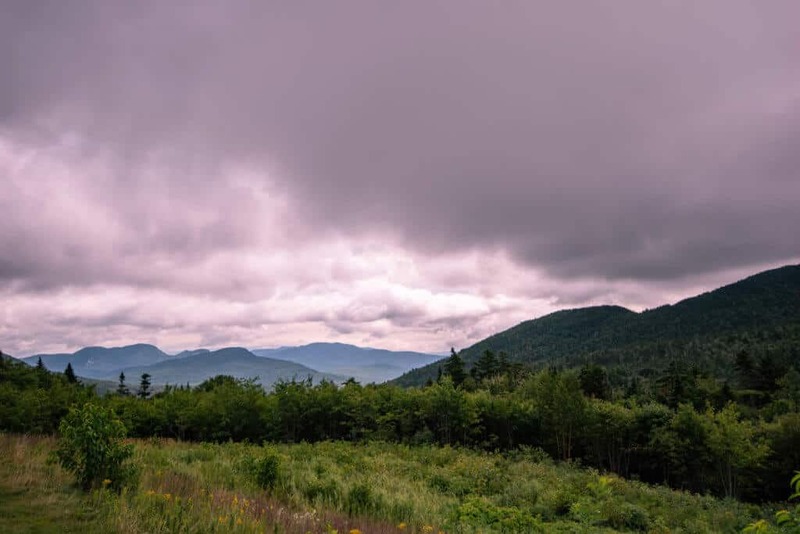 Here are some beautiful Kancamagus Highway attractions that don’t require an all-day hike or an above-average fitness level. They are listed from east to west. The Lincoln Woods Trail is an easy hike, and an even easier bike ride. 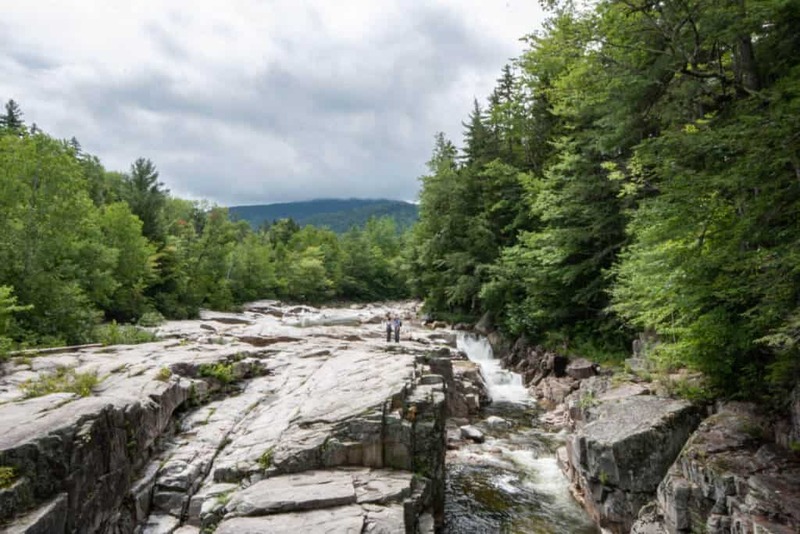 It’s one of the most popular hiking trails on the Kancamagus Highway, crossing the Pemigewasset River on a suspension footbridge, and traveling into one of the largest tracts of wilderness in the northeastern US. The most popular destination on the Lincoln Woods Trail is Franconia Falls, which is a series of waterfalls, natural rock slides, and swimming holes, perfect for exploring on a hot summer day. The Lincoln Woods Trail is an out-and-back trail that totals six miles. Leashed dogs are welcome. The Hancock Overlook provides one of the best views on the Kancamagus Highway. There’s a little covered gazebo where you can take in the views and eat your lunch, and we were smitten by the tall, lonely “heart tree” near the parking lot. You may not spend more than 15 minutes here, but it’s definitely worth the stop, especially if you have a camera. Sabbaday Falls is one of the most popular Kancamagus Highway attractions. Normally, we try and stay away from huge crowds at natural attractions, but this one is worth visiting if the parking lot isn’t too full. The short path to Sabbaday Falls is handicapped accessible, and after a five-minute walk, you will be greeted with two plunging waterfalls and a five-foot-high punchbowl. There are boardwalks throughout, and visitors are able to view the falls from many different angles for good photo opps. The only downside to visiting this gorgeous waterfall? The incredibly clear waters are perfect for swimming, which unfortunately isn’t allowed. 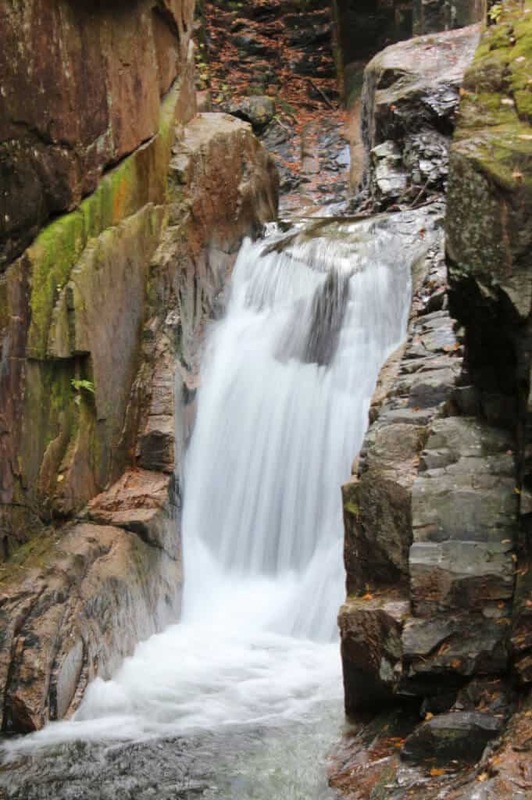 Sabbaday Falls, along with dozens of other waterfalls in the White Mountains, can be found in the fabulous book, New England Waterfalls by Greg Parsons and Kate B. Watson. This is one of the most dog-eared books I own. I promise you will find it useful if you live in New England or visit often! 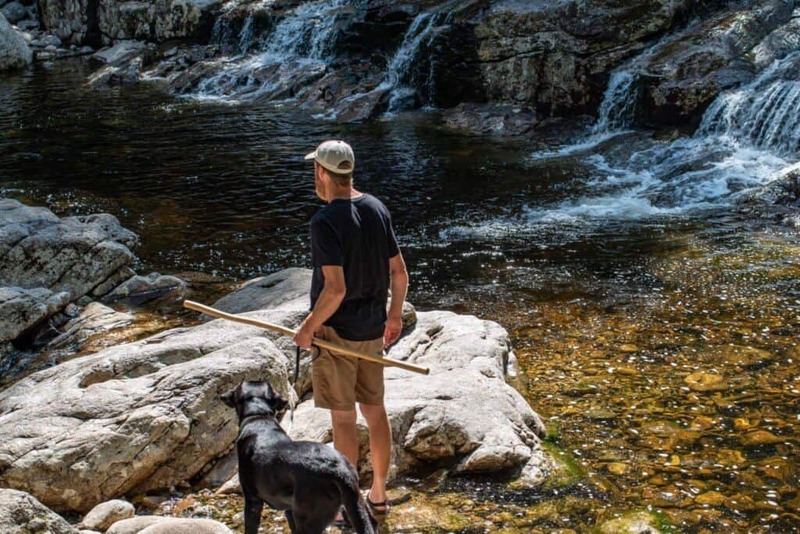 Not only is Rocky Gorge an awesome spot for a picnic, the area also provides access to trails for long and short jaunts into the White Mountain National Forest. There is a footbridge that crosses the Swift River as it narrows into Rocky Gorge. Visitors can cross the footbridge and hike the one-mile trail around Falls Pond, or they can head out onto the rocks to get a better view of the cascades. There is no swimming within 400 feet of the gorge, but we saw lots of people swimming upstream. The Albany Covered Bridge crosses the 120 feet over the Swift River, and was built in 1858. It’s a beautiful bridge to photograph, especially during the fall foliage season. You can drive over the bridge in three seasons, and pedestrians are welcome year-round. Driving through the Albany Covered Bridge on Dugaway Road will take you to the Covered Bridge Campground. You can also access the Boulder Loop hiking trail from the parking area, which is a 2.8-mile loop with fabulous views of the surrounding mountains. 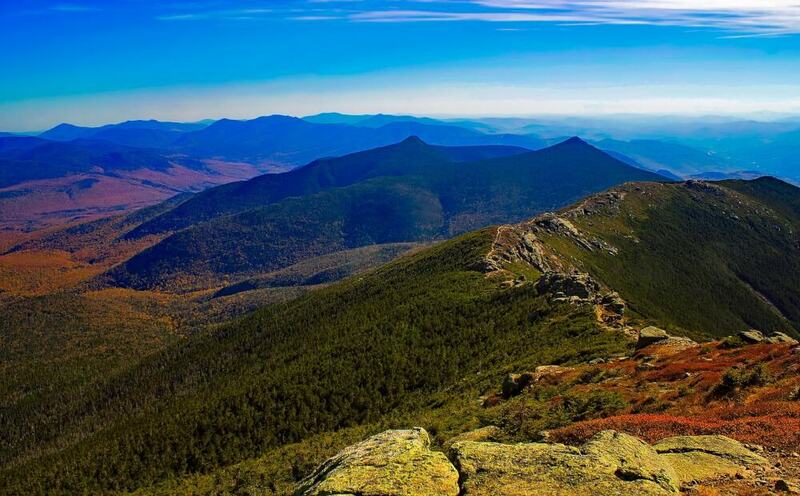 Located just north of Lincoln, NH, Franconia Notch State Park spans 6,693 acres in the White Mountains. The park is home to the Appalachian Trail, numerous lakes for swimming and paddling, world-famous waterfalls, an 8.7-mile bike path, and the Cannon Mountain Aerial Tramway, which was the first passenger aerial tramway in North America. Franconia Notch State Park is truly one of the most stunning state parks I’ve ever been too. The highlight of our visit to Franconia Notch was exploring the waterfalls on the Basin Cascade Trail. There are several waterfalls along the trail, which is rated as easy to moderate, depending on how far you want to hike. It’s about 1.1 miles to the last waterfall, Rocky Glen Falls. The farther along the trail you hike, the fewer people you’ll see. Another popular attraction is the Flume Gorge, which includes a two-mile, self-guided nature walk, complete with covered bridges, boardwalks, and narrow walkways. We did not visit Flume Gorge, as dogs aren’t allowed. We may try and get there next time, especially after watching this video. Loon Mountain is located right in Lincoln, NH, and is best known for Loon Mountain Ski Resort, which has become an all-season recreation area in the heart of the western White Mountains. Loon Mountain Resort maintains an aerial adventure park, a gondola ride to the summit, ziplines, disc golf, bike rentals, and a climbing wall. I highly recommend taking the gondola ride to the top, as it offers up one of the best views in the Whites. From the summit, you will see the Kinsmans and the Cannonballs, Moosilauke, Liberty, Flume,Lincoln, Lafayette, Big Coolidge, Whaleback, Owls Head, Guyot, Jefferson, Adams,, and Tecumseh. If you want more of a workout, you can hike up the Lower and Upper Walking Boss Trails — it’s about 2 miles to the top, and quite a climb! 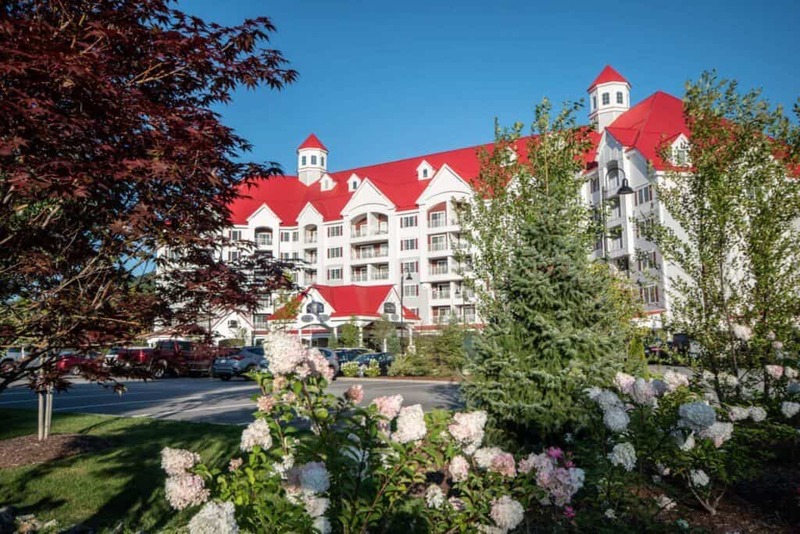 RiverWalk Resort at Loon Mountain is located in the heart of Lincoln, NH. We always try and find lodging that allows us to explore local communities on foot, as it’s one of our favorite things to do. The resort is set at the base of South Peak, and its dazzling presence makes quite a striking impression. It is affectionately known as the White Castle, with its massive, snow-white exterior and bright-red roof. 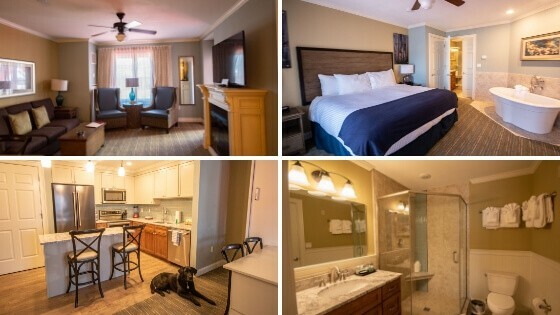 All of the rooms at RiverWalk Resort are spacious suites, with fully-stocked kitchens, modern bathrooms, balconies, and electric fireplaces. Whether you need a small studio for one, or a spacious penthouse suite, there’s a room at the RiverWalk for you and your family. The furnishings are modern and bright, and the views are spectacular. 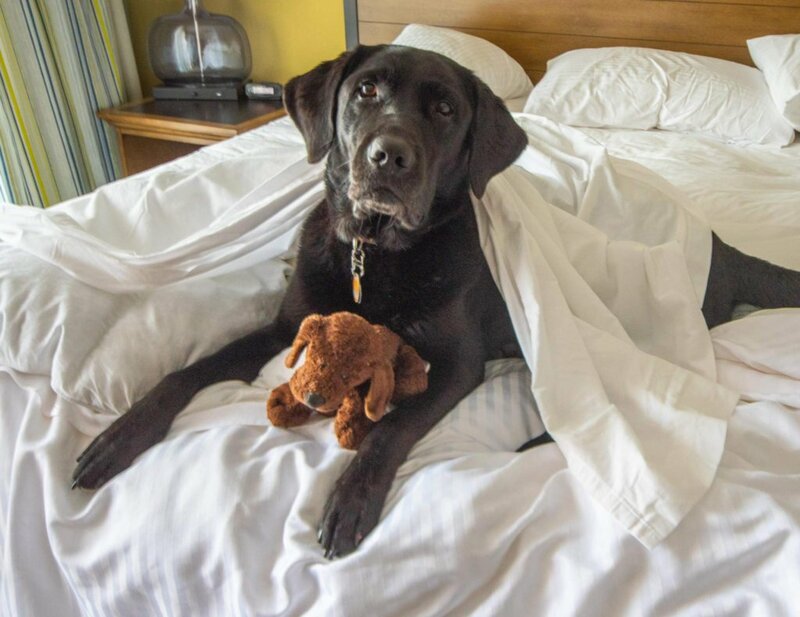 Dogs are even welcome in many of the rooms, and we were so happy that we got to bring Flynn along on our Lincoln, NH getaway. RiverWalk Resort is very pet-friendly! While you may never want to leave your suite at the RiverWalk Resort we urge you to do a little exploring. Feeling worn out after a long day of hiking? Book a treatment at the Solstice North Day Spa or unwind with a wine tasting at Seven Birches Winery. The Riverwalk maintains year-round heated pools and hot tubs, a full-service fitness room, an awesome game room (with a pool table and arcade games), and an ice-skating rink in the winter. Be sure to visit La Vista Italian Cuisine Restaurant for awesome wood-fired pizza. The RiverWalk pools was pretty awesome! Another one of our favorite pastimes is exploring the craft-beer scene in the small towns we visit across the country. 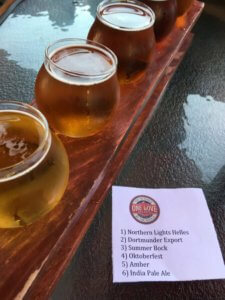 On this trip, we were lucky to find One Love Brewery, which was a five-minute walk from RiverWalk Resort and dog-friendly! It was a beautiful evening on the deck, and there were lots of other dogs hanging out with their families. Eric and I ordered a flight, a selection of six One-Love beer samples for $11. This is our favorite way to try new beers. Our favorite was the Oktoberfest, but all of the beers were pretty tasty. The menu is pretty interesting, but we can only vouch for the burgers. One veggie, one regular. Very tasty, although the veggie burger was on the dry side. As long as you don’t mind cold, clear, mountain water, you will find plenty of spots to cool off near Lincoln, NH. Our favorite swimming spot of the trip was in the Pemigewasset River at the Hancock Campground. There is a short trail leading from the campground to the river. The swimming area is large, deep, and cold, plus there are lots of spots to spread out on the shore for an all-day adventure. 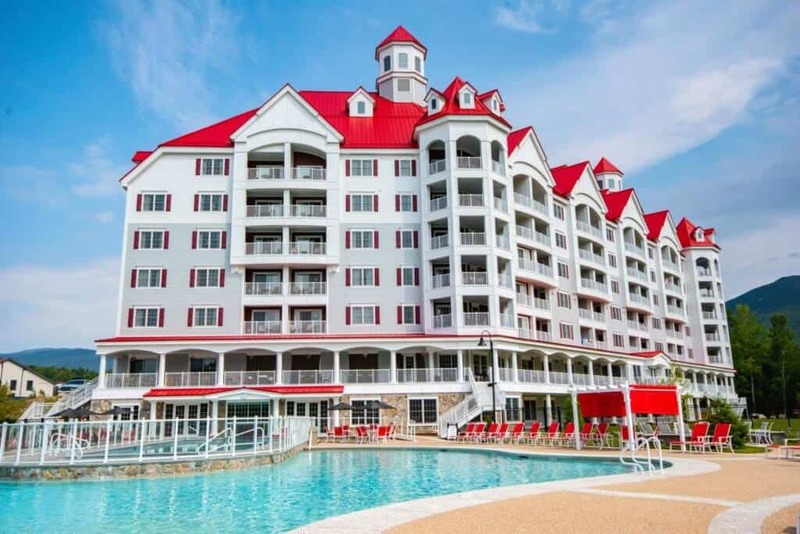 If you happen to be staying at RiverWalk Resort and don’t want to swim in the beautiful, heated pool (that’s my husband), you can meander along the J.E. Henry Trail behind the resort until you come to a small, private swimming hole. This is on also the Pemigewasset River, and it’s a great way to wake up on a summer morning. Our last recommendation for awesome swimming is just off the Kancamagus Highway at the Lower Falls Scenic Area. It’s closer to Conway than Lincoln, but it’s a lovely place to picnic, swim, and take pictures. Truly a beautiful spot! The Kancamagus Highway – While we loved traveling the Kancamagus Highway in the summer, fall is absolutely spectacular. For a complete overview of scenic vistas, campgrounds, and trailheads, check out the Kancamagus Highway Info website. 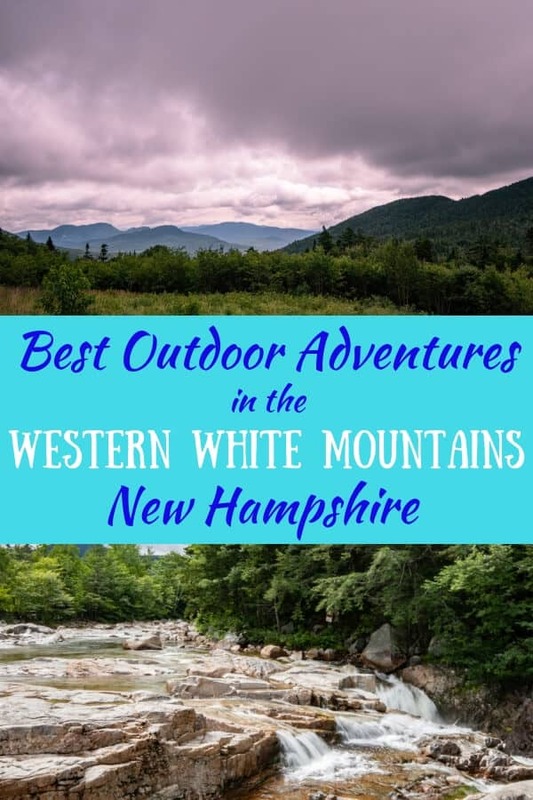 Western White Mountains Chamber of Commerce – A great resource for planning your White Mountain adventure, the Western White Mountains Chamber of Commerce website has a complete overview of attractions, dining, lodging, and shopping opportunities. We used it to plan our hikes and our meals, which was super helpful! White Mountains, New Hampshire – For more expansive trip planning, check out Visit White Mountains, where you’ll find trip-planning resources for all of the White Mountains. It’s definitely worth looking into the lodging deals if you are planning a visit. AllTrails – We use the AllTrails app whenever we’re planning hikes in areas we don’t know well. The summaries and up-to-date reviews give us great insight, and just about every trail we’ve looked for has been covered. Please note: While the post is not sponsored, we did receive a complimentary night’s stay at the RiverWalk Resort so we could include it here. Our goal is to provide our readers with useful, honest information about the destinations we visit. I’d drive the Kancamagus Highway just to see the fall foliage. I could really use a pretty drive like that right now! There’s not much in the way of fall colors in San Diego. I’d also love to visit the Rocky Gorge Scenic Area and Sabbaday Falls — such beautiful natural attractions! Can you really drive across that old covered wooden bridge? I’m surprised it hasn’t been closed to vehicle traffic — so pretty! Tami, that covered bridge actually IS open to vehicles… for the good weather months only. They close it in the winter months. It’s really a lovely bridge and leads to a road that runs parallel to the Kancamagus Highway on the north side of the river. There are sections of that road where it’s extremely narrow and there is a 100′ drop off down to the river. Not for the faint of heart like me! It connects to what is called Old West Side Road in Conway… which is a road that runs parallel with Rte 16. The reason I mention it, is that if people are looking for a way to avoid long lines of traffic through the town of Conway, leading up to North Conway… the Old West Side Road is a great alternative. Look it up on the maps. On the northern end is Cathedral Ledge, a spectacular spot to either rock climb (not me!) or drive up and look at the spectacular views (me). There’s also the lovely White Mountain Hotel and the Hale’s Location Golf Course on that end of the Old West Side Road. New Hampshire looks gorgeous! I’m hoping to do an East Coast road trip next summer and would love to visit this area. You dog is adorable! I think you will love New England, Alexa, especially in the summer. Feel free to contact me if you want tips for visiting the area. Happy to help. You absolutely sold me on New Hampshire! It’s not one of the states that I’ve really thought about visiting, but all the mountains, waterfalls, and trails make this the perfect destination for outdoor lovers. Booking this for next summer! Ironically, I live in Vermont and have just started really exploring New Hampshire over the past two years. There’s a lot to see! OMG, it’s gorgeous! NH is one of my last 8 states to visit. And this part is everything I want to fall in love with. I know that fall is obviously the most breathtaking time to visit, but how early in spring is too early? Hi Rob – It is a really lovely spot to visit, and I hope you make it out with your family someday. Don’t come before May – it’s a muddy mess until then, especially in the Mountains. I absolutely love the highway drives, especially when you stop along the way to see all of the sites. This looks like such a scenic trip to take. We retired to Lincoln after a lifetime of vacationing here (winter and summer). The hiking trails mentioned in the article are popular, but there are way more choices since the town was once a logging center, and the old logging RR tracks became hiking trails. I would encourage people to stop in at The Mountain Wanderer bookstore on Main Street (57 Main, on the end of town near Rte 93). 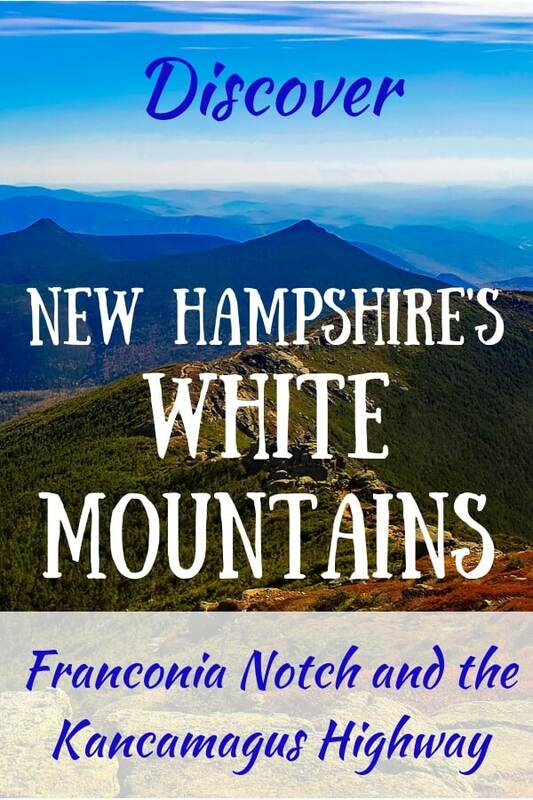 The owner, Steve Smith is a wealth of information about the White Mountains and actually is the current editor of the prestigious AMC White Mountain Guide, which is THE guide to hiking trails in the Whites. Steve also bushwacks into very interesting spots and can give you some insights into where you can find some really unusual views. He also posts his hikes on Facebook with lots of photos. I would urge visitors to observe the speed limit of 30mph when they’re in Lincoln. The Lincoln PD takes it very seriously, and people are regularly pulled over for ignoring it. Watch out especially when you’ve been on the Kancamagus Highway where speeds can be as high as 50+mph. It goes from 50 to 40 to 30 within about 1/4 mile. And there will often be a “speed trap” right where the 30mph sign is located! So if you speed in Lincoln you have a really good chance of paying a ticket. As far as restaurants go, I would highly recommend The Gypsy Cafe half way down Main St., as well as the Black Mountain Burger in the Depot Plaza on the east end of town. I’d also recommend White Mountain Bagel near Rte 93 and the RR tracks. Chinese food? I recommend Imperial Palace in North Woodstock, NH. North Woodstock is essentially a sister town of Lincoln, and is quite charming all by itself. Matter of fact, if you’re looking for genuine local NH maple syrup, go into Fadden’s General Store in downtown North Woodstock, NH (109 Main St.) This place is charming, it’s been around since 1896, family owned, and they make their own maple syrup. The real deal! Hi Rita! Where were you when we were planning our trip? We walked past the Mountain Wanderer several times, but didn’t stop in. We should have!! Oh well – that just means that we will have to go back. Thanks for all your great advice! If you want to follow Steve Smith on Facebook, it’s listed as “Mountain Wanderer Map & Book Store” Even if you’re not interested in hiking, he posts some gorgeous views from wilderness areas. Great post! Lincoln really is the adventure hub of the white mountains. We get up there as often as possible. Looking forward to getting up that way with the pup for the first time.